Indeed, the 20th century will be remembered for four scientific revolutions–Relativity, Quantum Mechanics, Chaos and Fractal Geometry. The Father of Chaos Theory is Edward Norton Lorenz (1917–2008) who was an American mathematician and meteorologist. Lorenz was certainly THE pioneer in Chaos Theory. A professor at MIT, Lorenz was the first to recognize what is now called chaotic behavior in the mathematical modeling of weather systems. During the 1950s, Lorenz observed that there was a cyclical non-linear nature to weather yet the field relied upon linear statistical models in meteorology to do weather forecasting. It was like trying to measure the circumference of a circle with a straight edge ruler. 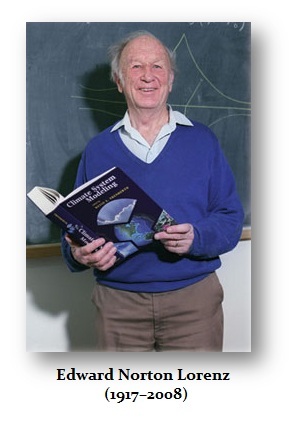 His work on the topic culminated in the publication of his 1963 paper Deterministic Non-periodic Flow in the Journal of the Atmospheric Sciences, and with it, the foundation of chaos theory. During the early 1960s, Lorenz had access to early computers. He was running what he thought would be random numbers and began to observe there was a duality of a hidden repetitive nature. He graphed the numbers that were derived from his study of convection rolls in the atmosphere. What emerged has been perhaps one of the most important discoveries in modern time. This illustration of the Lorenz Strange Attractor, is incredibly important and was first reported in 1963. Lorenz’s discovery of a strange attractor was made during an attempt to create a model of weather patterns. The actual experiment was an attempt to model atmospheric dynamics of the planet. It involved a truncated model of the Navier-Stokes equations. It is a visual example of a non-linear dynamic system corresponding to the long-term behavior in a cyclical manner revealing a hidden order we cannot otherwise observe. 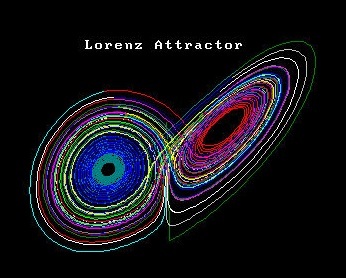 The Lorenz Strange Attractor is a 3-dimensional dynamical system that exhibits chaotic flow, noted for its interesting shape revolving around two invisible strange points in space-time we call Strange Attractors. The map shows how the state of a dynamical system with three variables of a three-dimensional system evolves over the fourth dimension time in a complex, yet non-repeating pattern. In other words, here is a visualization of duality – what appears to be randomness (chaos) yet simultaneously there is a broader clear pattern of order. The same identical structure appears in light where it is both a wave form and particle, as we see in the economy where we retain our individuality yet at the same time we are part of a broader collective pattern. This is the very essence of the Invisible Hand – or in Lorenz terms, a Strange Attractor. Therefore, Chaos theory is a field of study in mathematics, with applications in several disciplines including meteorology, physics, engineering, economics, biology, and philosophy. Chaos theory investigates the behavior of dynamical systems that are highly sensitive to initial conditions and subtle changes in the input can created drastic alternative in the outcome. This has been explained as the “effect” which is popularly referred to as the butterfly effect. Slight differences in initial conditions yield widely diverging outcomes for such dynamical systems, rendering long-term prediction impossible in general without comprehending dynamic analysis that is cyclical based. This chaos that appears is complex, yet it masks a hidden order beneath. The complexity of variables creates the illusion that these systems are unpredictable yet they can be extremely deterministic when viewed correctly. The future behavior of such systems is entirely determined by their initial conditions, with no random elements involved whatsoever. In other words, the deterministic nature of these systems allows them to be predictable when approached objectively by a computer eliminating the randomness of human judgment. This type of behavior is best described as Deterministic Chaos. This extraordinary complexity of that created the surface impression of chaos, hides amazing order hidden below. This Chaotic Behavior can be observed in many natural systems, from such things as weather to economics. Our problem has been mankind’s attempt to reduce everything he sees to simple minded one-dimensional cause and effect. This type of explanation of such behavior has restrained our ability to move forward in many fields, the least of which is not social-science that includes economics. Deterministic Chaos may be the key to everything for within both nature and our social world, we are surrounded with complexity yet we try to rationalize everything to a single dimension unable to cope with the dynamics of the world in which we live.